This adult plant bug was found in abundance on fresh growth of Creosote Bush (Larrea tridentata) in Rainbow Valley, w. of the Sierra Estrella, Maricopa Co., Arizona, USA. April 2010. The bug is sitting on the fabric of a sweep net, similar to a butterfly net, but with tougher matterial. Identification was made by WonGun Kim. For the scientific name of this insect the name Orthotylinae has been used because there are many, many different species (1930 and counting in North America n. of Mexico) of variously green plant bugs in the family Miridae. Entomologists further divide the family into seven subfamilies. It appears that this species belongs to the subfamily Orthotylinae. Mirid bugs have specialized, piercing-sucking mouthparts that they insert into plant tissues and then pump plant fluids up through a narrow channel much like a person using a straw. Their feeding tends to be concentrated at the most nutritious parts of the plants namely the developing seeds/fruit. When these aren't available they will feed on new, growing shoots. Mirids have good eye sight and are quick to move if they sense that their movements are being targeted. 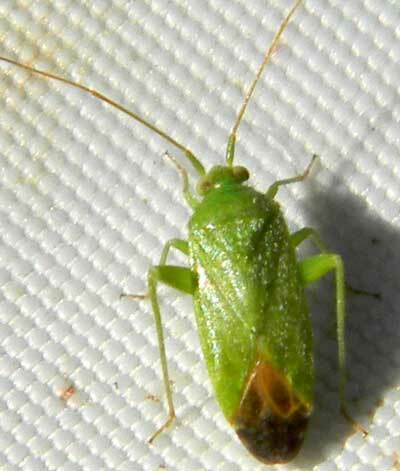 Adult plant bugs have fully developted wings folded over their dorsum and can take flight in an instant when threatened. This Creosote Bush Plant Bug has a green and golden-brown color pattern that allows it to hide effectively on its usual host.